According to the American Academy of Pediatrics children or infants should see a dentist after their first tooth erupts or no later than a child’s first birthday. However, according to a survey conducted in 2009 most children don’t see a dentist until they are 2.6 years old. The child is too young to see a dentist. The child doesn’t have enough teeth. The lack of insurance coverage or cost. The dangerous reality is that parents avoid taking their child to a dentist due to cost but may not realize that a child’s primary or baby teeth are just as important as the adult or permanent teeth. Don’t let cost dictate the health of your child’s smile! Let Penn Dental Medicine help you focus on your child’s dental health with an inexpensive pediatric dentist! Before we discuss the reason Penn Dental Medicine is the best inexpensive pediatric dentist for your child’s dental health success let’s first look at why the health of primary or baby teeth is so important. 2-11 year olds have 1.6 decayed primary teeth and 3.6 decayed primary surfaces. While these numbers are a bit shocking, this captures the importance of why taking your child to a dentist as early as possible matters. Primary teeth are very important in the health and development of your child’s speech, smile, and chewing. Baby teeth are also important for holding space for your child’s permanent teeth to come in. If a baby tooth is lost too soon this can cause other permanent teeth to shift and move into open spaces causing overcrowding or crooked teeth. 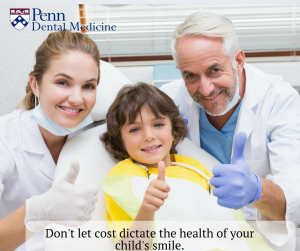 Because Penn Dental Medicine is a teaching clinic for future pediatric dentists, our patients receive quality care without the cost of a private dental office. But that’s not the only reason an affordable pediatric dentist benefits you and your child. Our pediatric student dentists are being trained and mentored by some of the top pediatric dentists in the industry. This means your child is ensured to have the most thorough and extensive pediatric dental care that you wouldn’t find in a local dental office. Don’t let the cost of dental visits dictate your child’s oral health. Come to Penn Dental Medicine and see why our inexpensive pediatric dentist can benefit your child’s smile! Contact us today to see how your child can become a patient.